foobar2000 has been written specifically for the Windows platform, and there are no plans to port it to any others. However, although not officially supported, it is known to run on Linux and Mac OS X through Wine and WineBottler, respectively. Also there is Arch Linux native package maintained by community member. Powerful open component architecture allowing third-party developers to extend functionality of the player, including the ability to fully replace the user interface. Full Unicode support: File names, user interface, tagging, etc. ReplayGain support: Both playback and writing ReplayGain information to file tags. Advanced tagging capabilities - through built-in Properties dialog and various optional tagging-related components. Intuitive query syntax for searching the Media Library. Autoplaylist support: Generate dynamically updating playlists based on queries. Support for transcoding all supported audio formats using the Converter component (requires external command-line encoder executables for different output formats). Efficient handling of large playlists. User interface with simple configuration to create even complex layouts quickly and easily. Highly customizable display of track information using title formatting scripts. MP1, MP2, MP3, MP4, Musepack, AAC, Ogg Vorbis, FLAC / Ogg FLAC, Speex, WavPack, WAV, AIFF, AU/SND, CDDA, WMA, Matroska, ALAC, MMS, RSTP, Opus. TTA, Monkey's Audio, MOD, SPC, Shorten, OptimFROG, AC3, DTS, PSF, NSF, XID, XA, TAK, AMR, etc. Query Syntax: details of Syntax for querying metadata. Titleformat Examples: user-submitted code for various purposes; submit your own! fb2k Wiki Page for Japanese users. 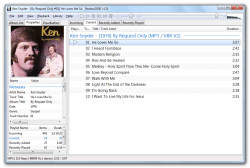 Winamp To Foobar Guide with information relevant for general users also. This page was last modified on 11 March 2019, at 19:31. This page has been accessed 2,316,562 times.